Funny to think about not blogging since April. I put such an emphasis on National Poetry Month and then my motivation for writing seems to disappear. I suppose it was also around that time that things really began to shift up and down in my world. I applied for a job in Washington state. It took the potential employer a long time to make up his mind, but eventually he came to a decision and I didn't get the job. But we decided to move home anyways. The really wonderful and terrifying thing about trusting God is that sometimes he thrusts an adventure into your schedule at the last minute and you have no choice but to follow along--we could have had a grand expedition across the country, or not moved home and been homeless and poor and continued in various types of misery. We went home to Washington briefly the end of June/beginning of July for my parents' 40th wedding anniversary. Their anniversary weekend was held in Bandon, Oregon at one of my family's favorite coastal locations. It was the best vacation I've ever experienced. It wasn't glamorous or particularly thrilling but we drank lots of coffee and ate lots of tacos. I collected lots of seashells and sunburns. (Yes, you read that correctly.) We also began making plans for the move home. When we arrived back in Illinois we had just 20 days to raise the money for the move along with pack up our lives. This is not an exciting thing to write about so I'll be brief. 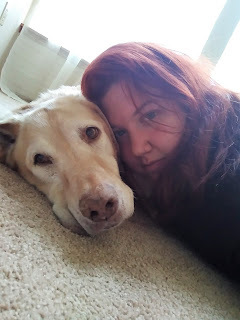 We worked a lot, I had several doctor's appointments and one biopsy, we had trouble getting the trailer for the move and didn't have a lot of money and our last few days in Illinois were terrible. Also our whole county was flooded. I didn't sleep a lot. The drive back to Seattle was the worst road trip I could have imagined. We had car trouble, and because of the loaded trailer (which was packed to the brim with belongings, but no furniture--I had to leave all of that behind) our gas costs doubled. Rather than spend money on lodgings we occasionally slept for a few hours in parking lots. The dog enjoyed the trip immensely, of course. We had her kennel cradled in the backseat and she just slept in there, peering out the window occasionally. Driving a little sedan with a 2000-pound trailer behind it is awful. As a short person, I often do not enjoy driving simply because I feel physically disadvantaged. My hands also go numb. But on the last leg of the trip Joey had grown tired (no surprise there) and I was SO OVER being in the car. The Rocky Mountains had really done us in--it was a slow ascent, descent, ascent, descent, over and over again all through western Montana and all of Idaho. Joey was exhausted by it all. So the second-to-last stretch of the trip was all me. It was the middle of the night but I was a warrior of darkness and speed. I took us all the way down out of Idaho and trekked through Eastern Washington until we found a Walmart parking lot for the night. The next morning we finished the drive to Seattle. The dog perked up as soon as we rounded Snoqualmie Pass and couldn't stop sticking her little head out the window. The air was so fresh and clean in comparison to the midwest, and I think she knew we were home. Since then things have been mostly steady. We house-sat for relatives, then stayed with a friend for a few days, then house-sat again, and now we're renting a room from a family friend. The last several days have been heartbreaking as we had to put Holly down on Friday. I am not sure what comes next. I don't have a job, so I have a lot of time by myself while Joey is at work. I'm trying to figure out what I'm supposed to do. God has allowed me to experience some great losses in all this. I've lost my beautiful little church and the family within it, I've lost all my furniture, and don't have access to my worldly possessions as they are all in storage. I've lost my job simply by moving away from it and now I've lost Holly, my very best friend in the whole world. I've been in these valleys before. I know this one like the back of my hand. But there is so much pressure to deny the valley any power, to simply trek back on up the mountain and stay there because that's "how it's done." I just have a feeling that I have to live in the valley for a little while--to rest in the shadows from the mountains, to drink from the rivers, to pause and reflect on all the mountainous land surrounding me before choosing which one to climb.